Using the principles of traction coupled with relaxation, specialized props which facilitate realignment and energy flow, our 90 minute classes teach each student how to improve flexibility and strength. CLASS SCHEDULE: All classes are not in the same location. Take time to scroll to bottom of the box below for further details. Call Kathleen at 302-981-0777 for further information. Class cost: Based on $25 per class; the senior discount applies to able-bodied students. This class runs during the school year only. Our classes are small enough for you to fit in at any level of age or flexibility. In each class you will be developing at your own rate of learning based on the Iyengar method of teaching to the individual. Our pricing is higher than the larger studios based on personalized instruction. Classes run in 8 week segments based on $25 per class. Note: Financial difficulties...? Please let us know and we can work together so that you can regularly attend classes. Drop-in students who do not wish to register for a series are permitted in any class, if there is space (first come, first served). Drop-in students may come for a first class & decide to become a regular part of ongoing classes. You may commence your series mid-term, by permission of the teacher. All Series are based on 8-week segments which are to be paid for at the beginning of the 2 month period. Continuing students are allowed to join ANY class to make up one of the 8 classes which were pre-paid. All make-up classes must be completed before the end of that 8 week period (you may therefore come more than once in a given week). The lump sum payment for a 2 month series is non-refundable. Every effort to accommodate a special circumstance will be made. However you must bring the situation to the teacher's attention immediately. Attractive gift cards with envelopes are available for you to give an individual participation at $25/class in group classes or private classes at $70/hour. Gift certificates are valid for 12 months from date of purchase. To give you a better idea of how different our classes are from the norm, look at the above image showing Chair Yoga with props. We are celebrating our 20th year of continuous operations! Thank you to all of our students who have passed through our studio and those who have been with us throughout! Regularly scheduled classes for 2018 are now posted. The Fall Series 2018 begins the first Tuesday after Labor Day. We will continue our regularly class schedule through mid-December. The Winter/Spring schedule commences the second week in January 2019. Enrichment of my teaching and personal practice has been deepened in 2017/2018. Many thanks to Practice Yoga Studio in Philadelphia and Simply Yoga in Princeton, NJ for hosting their workshops. Yoga takes the individual student step-by-step to under-STAND the technique of coming alive to one's own balance, strength and flexibility. Life is rushed and some yoga classes are taught in a fast-paced, rushed manner that does not contribute to learning on a deep level. Yoga is slow, steady learning process thats extends your brain from the bottom of your foot to the top of your head. This takes time! 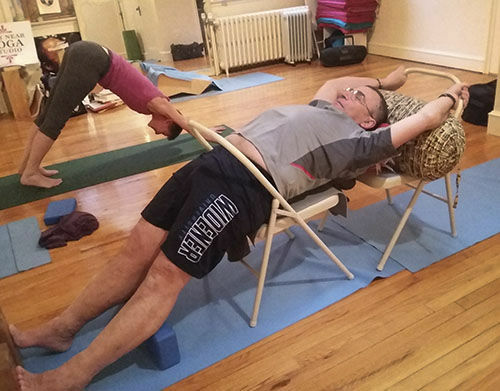 The use of props, for instance, including blocks and belts to help you stretch when you "just can't reach that far"; bolsters and blankets used to gradually open the back and hips that have become "too stiff to bend that way"; chair, walls and floor to assist the spine in extension eventually will allow all of you who are new to yoga to use it as "the golden key which unlocks the door to peace, tranquility and joy". At the Very Near Yoga Studio, your experience will be as though you were attending a mini-workshop. 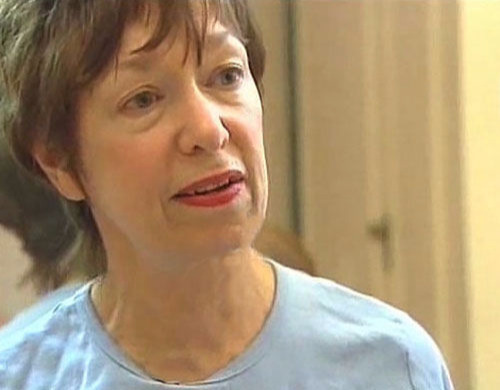 Our classes offer great solutions for the problems of aging and the stress of modern life. Using the principles of traction coupled with relaxation and deep breathing, using specialized props which facilitate realignment and energy flow, our 90 minute classes present the student with the techniques to carry on the process at home. 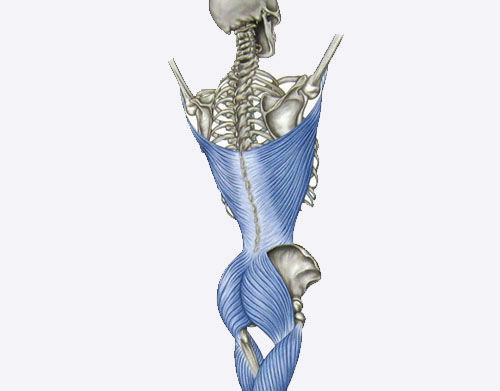 As the above illustration shows, the muscle groups of the rib cage, lower back, glutes and hamstrings are all connected, but separate. Upper torso flexibility is an important component of oxygenating the heart and lung functions. Integrating the systems of heart and lung function with lower body mobility, we will get you out of your rocking chair!